Nagios Core is the open source monitoring engine that serves as the primary application around which hundreds of Nagios projects are built. 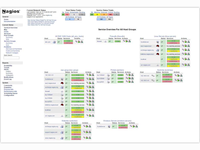 Nagios Core Reviews Recently Reviewed! 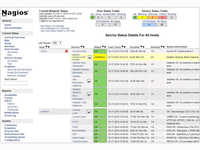 Nagios is a platform created to monitor network services and member teams of the same. Pros: - The main advantage of nagios is that it allows you to be aware of the status of each host and services belonging to a network. - Another advantage that nagios has is that it has several types of alerts, with which it indicates the type of failure that a host can present and thus be able to solve it as quickly as possible. - Nagios allows you to integrate with other platforms, something that enriches the amount of benefits you can get from this service. - A very good advantage of Nagios is that its code is open, which allows you to make changes and adjustments according to the needs you have in your network. Cons: - Something that would be good to improve in nagios is the fact that by increasing the amount of host in the network, the update takes a little longer, causing some delay in the alerts that can be issued. - It would also be good to create a version with the basic functions and easy installation for users with little experience, since to configure nagios requires a certain level of knowledge with free software. Overall: Nagios is a service mainly used to monitor the components of a network, it gives you the benefit that in case of any failure such as high latencies, packet loss or total loss, nagios issues alerts quickly so that you can solve the problem as soon as. Pros: Nagios Core can do literally anything you need it to thanks to the amazing developer community and their ability to program custom addons. Need to monitor servers all over the world? No problem. Need to schedule outages and downtime? No problem. Need to monitor a custom system that only a handful of people use? There is most likely a module for that as well. Cons: To make it all work, you need to have advanced knowledge of linux command line administration and the ability to modify configuration files from the command line. Also, a few years of practice won't hurt to learn how to fully utilize Nagios Core. Overall: Monitoring of servers and individual services with easy to use notifications and alerts. Pros: -High adoption: Many IT shops are familiar with Nagios Core, lots of discussion and documentation available for the product. If there are questions we have, we can rely on the skillsets of our administrators, and fall-back to online documentation/community support. -Multi-platform endpoint support: Monitoring Windows/Linux servers/workstations is possible, and is leverage in our environment for hundreds of endpoints. -On-call escalations: We use Nagios Core to notify on-call staff of outages for services for multip teams, via email and SMS messages. 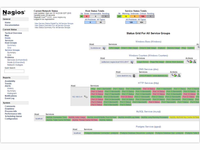 Nagios is the foundation of on-call system. -Integrates well with revision control support: configurations are managed within config files, and can be easily managed and control with popular code revision software. Cons: -Config file housekeeping: If there are multiple people contributing and managing config files for Nagios, there is a high potential for confusion and messiness within the config files. Training or clear policies regarding organization and contributions to theconfig files is HIGHLY recommended to maintain sanity. Clearly documented practices regarding notification groups for montored endpoints is also HIGHLY recommended to decrease the chances of confusing alerting behaviors for critical systems. Committing files to a revision control software is highly recommended and a watchful eye on the consistency of contributions is key. -Not a slick feature-rich experience out of the box: What you put into it is what you get out of it. Like many open source solutions, commitment and resources from the stakeholders managing this solution will be required in order to get the most from it. Pros: Among the advantages offered by nagios, is the fact that you can monitor all the equipment and services you have in a network, in this way you can know the status of each one, something that is very useful to validate that everything is working correctly in network. 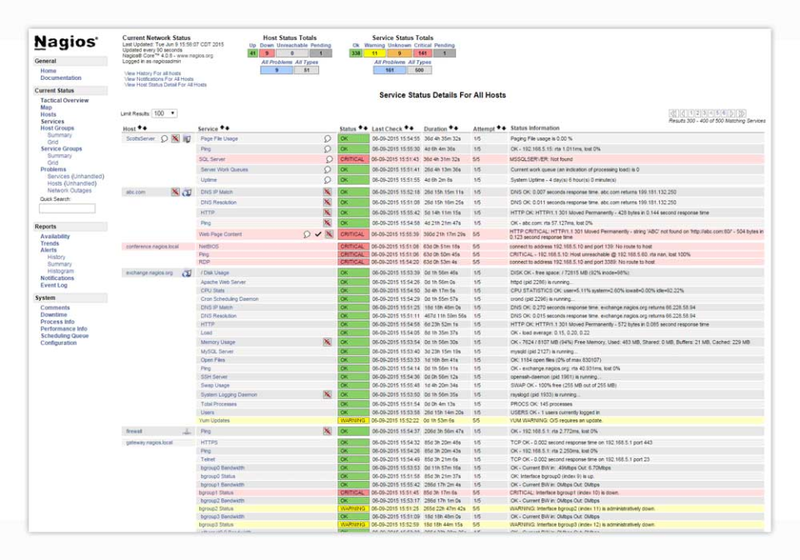 Another advantage that nagios has is that it gives you several types of alerts, it shows you if a host is missing packages, if it has high latencies or if it is completely down, this is useful because it helps you to better detect the type of failure that may occur . Nagios also offers you the implementation with other platforms, which is useful when you monitor a network and at the same time use other tools to manage it. Cons: Something that does not have very in favor nagios is that when the network is very large it takes a long time to update, which generates some delay in the alerts that can emit some host. Another disadvantage that nagios has is that the configuration is somewhat complex, which requires high knowledge in that area. 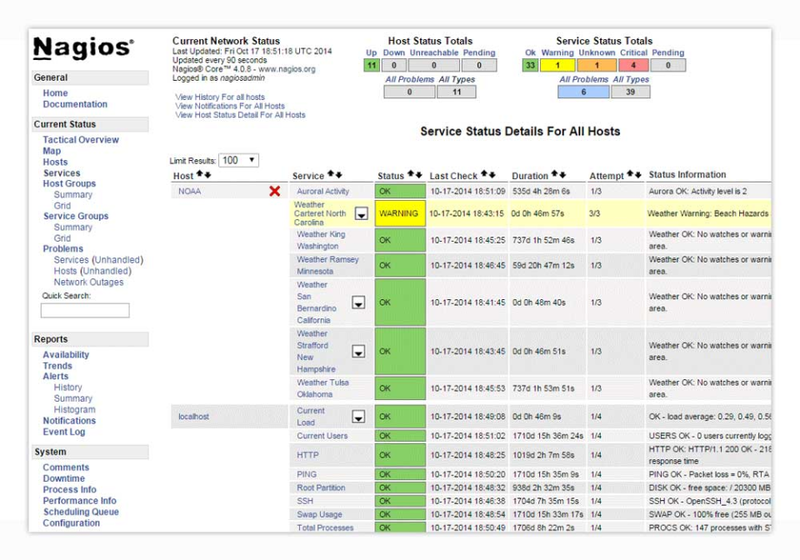 Overall: Nagios is a platform that allows you to effectively monitor all the components or elements of a network. It offers several types of alerts with which you can identify the type of failure that the host or service may be presenting. Pros: Tons of monitoring plugins are already available on the internet and if not you can easily write your own plugin. Communication between Nagios server and agents can be secured with SSL. Cons: Auto-discovery feature is missing. User interface (website) is not modern and for example visualize section is useless. You must manually distribute configs across your infrastructure. Overall: We know about problems earlier then our customers. 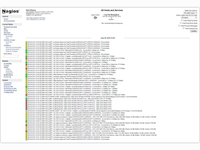 Pros: Nagios Core is free to purchase and install that can track almost any network device on your network. The graphs and what it tracks is fascinating to watch with real time data. Cons: The setup and installation is the main headache about this software. It must run on Linux and is very hard to configure unless you are very familiar with UNIX coding. Pros: it have a nice map mode, show the status of all devices in the network: uptime, ping, packet loss. 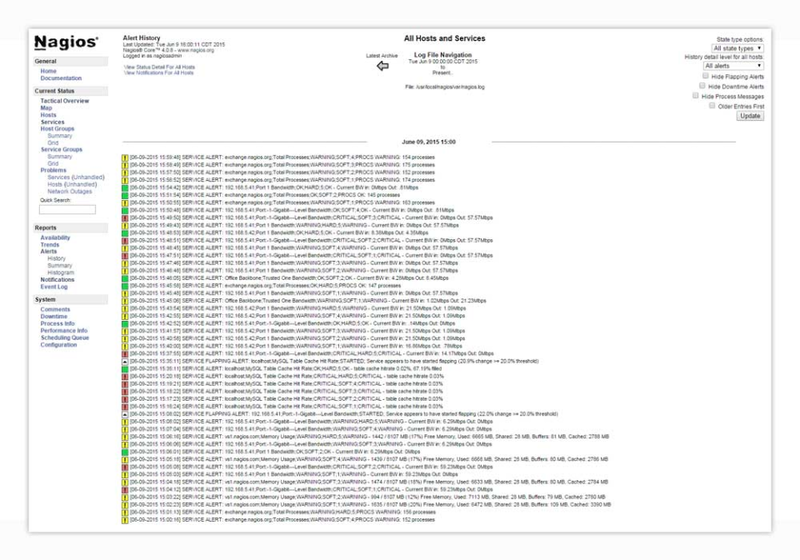 also show you the alerts history in the network, it use a very easy interface with basic colors: green for up status, yellow for packet loss and red for down status. the installation in the core is so easy, and more if you use linux. Cons: Configuration is not so easy, and the interface is only in english, maybe they can add more language on the interface. Pros: 1) It is very helpful for monitoring of different services like memory, total processes, ping response, swap usage, uptime etc of different servers. 2) It helps to configure services of windows and linux servers seperately. 3) It is used to configure graphs of different services for different servers. 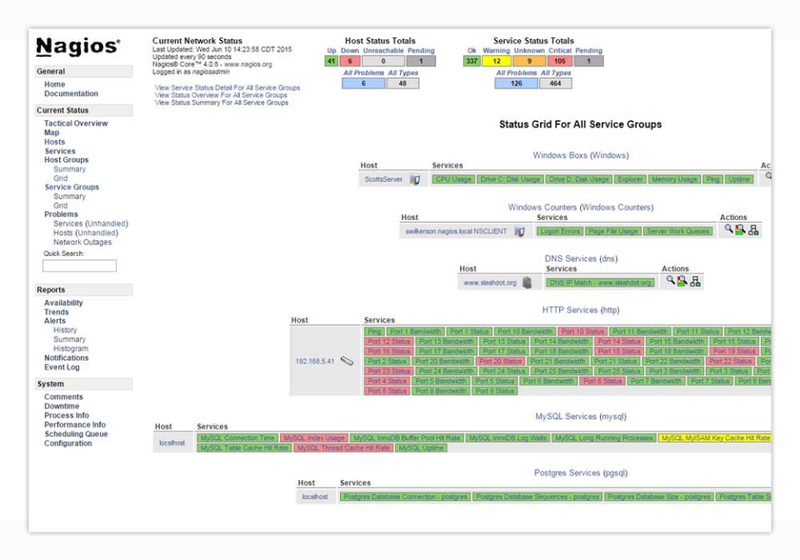 4) It helps us to know which servers are in critical state and warning state by looking into Nagios core GUI. 5) It sends us notifications for server in up or down state and also for critical and warning state. Cons: 1) It becomes very difficult to configure different services as plugins are not given in official documentation. 2) Very difficult to find logs for a single change in configuration. 3) No proper documents are available for setting configuration of nagios . One out of 15 document is helpful. Overall: I set up latest version of Nagios. It was a very good experience. I used postfix for email notifications. Best free network monitoring tool. Pros: Besides the price (Free), this tool gives and admin the ability to monitor hosts and services on that host easily, reliably and accurately. Its configuration is very simple and can be done in just minutes, starting from a file with the IPs of all the computers in the network and its host name, which is always usually at hand. Once this configuration is done, the tool starts to get all the reports. Cons: Graphs and statistics are a bit more difficult to create. To create a graph view it takes a little bit more time to configure than other solutions out there. Pros: -Very easy to install. -Effective tool for watch all conection on a big network. -Good for keeping track on the servers. Cons: -Initial configure is easy but adminitrate it is for specialist. Pros: Used Nagios for alerting capabilities and it never let us down. Cons: Slow development, most users migrate off to use Icinga (a fork of Nagios) instead for this reason. Overall: I'm a user since like forever and Nagios never let me down. It's a little old-school these days, but it's better than start learning a new interface every odd week. Agent on all computers that will be monitored. Pros: It's great to have a way to track instantly when a branch goes down or when speeds may be effected due to abuse at a certain branch. Cons: The fact that it's not very user friendly for people with little to no experience with command line, absent GUI for importing. Overall: We know a branch has gone down sometimes even before they are aware. It gives us the best chance of getting a branch back online before business is impacted. Pros: Nagios Core is easy to set up and use. Monitors all your servers and services on any chosen device on your network all on just one screen. If anything turns off or goes wrong, you will know as soon as it happens and can fix it right away. Amazing overview tool to keep an eye on anything on your network. Cons: Email notifications are a bit of a pain to set up if you're using an external exchange server like Office 365, and not hosting your own. Overall: Nagios Core has been helping me keep an eye on all the servers and storage space on any device. As soon as it gets to a certain load limit, it will notify me and I can fix it before it's too late. 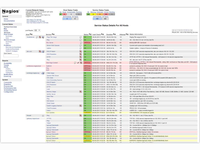 Nagios does monitoring well, as well as you have set it up correctly. Pros: The best thing about Nagios Core is that it is freeware and it does system monitoring pretty well for being free. Cons: What I like least is that there is no graphical user interface, if you use Nagios you should really get Nagios XI to make your life easier when it comes to setting up monitors. 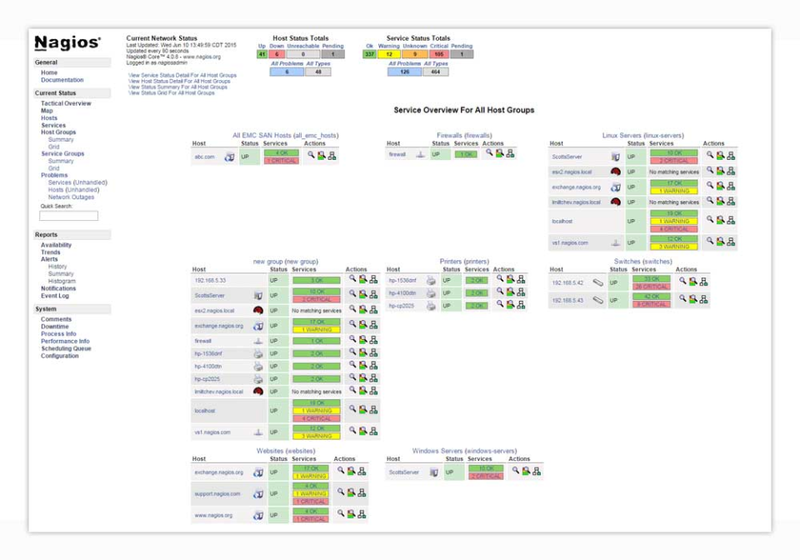 Overall: Monitoring is a key need in any Service Desk and Nagios helps with that a great deal. Make sure you have someone who will know how to setup monitors with in a command line environment or that you are using Nagios XI. Opensource main option to monitor your environment. Try it! Pros: Monitor even your soul. From Network, to automate the recovery, all you got to do with nagios! It's amazing! Cons: A little difficult to start and learn to use. But just a little bit. After sometime you learn and the sky is your limit. Overall: Opensource option in many companies. I may tell you that nearly everything is allowed to monitor or integrate in this tool. It's really amazing. Of course,some stuff require more time to do, that other applications, but certainly it can be done with nagios. I may say that if you didn't go what you want, you just not used the right plug-in. Pros: It is free to use (up to a certain number of hosts) and it contains a large range of helpful features; Several types of alerts, escalations, downtimes etc. are all possible. Cons: It is tough to install and maintain, as some of the documentation is outdated. Configuration is complex, especially if you do it without a web frontend and it can be tricky to troubleshoot. Furthermore, the web interface (optional, but alot better to manage your hosts and checks) looks very outdated and clunky. Overall: We use it for monitoring our servers and make sure they remain up and running smoothly. Pros: Well, at least I can say that it´s free and it´s on every Linux repository, so installation should be easy. Cons: This application is very difficult to configure and its interface is terrible. I´d rather use another application.